“You don’t have to be a Great Books student to read the classics,” Contino said. 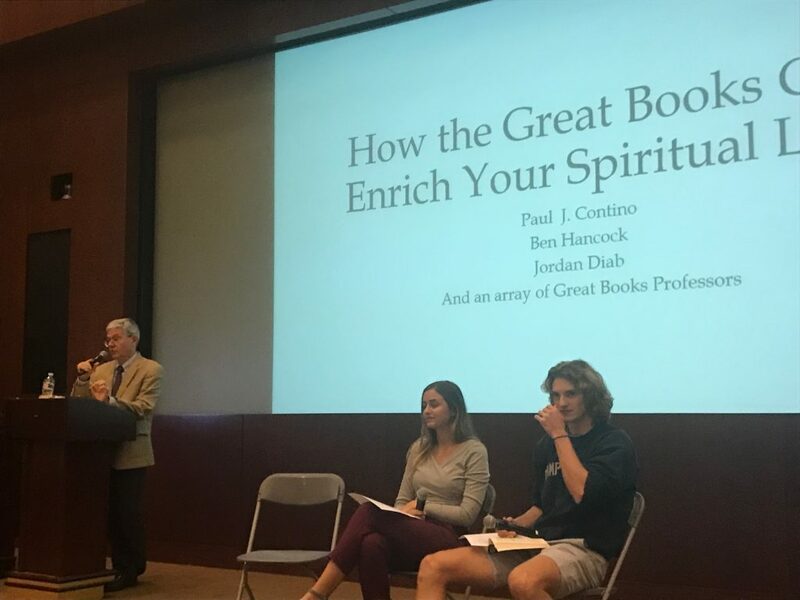 Contino said Great Books not only can impact spirituality and life but also said the life lessons learned through taking this series of classes are accessible to anybody who is willing to invest in reading classic pieces of literature. The convocation began with Contino speaking on the impact that literature, characters and stories can have on a person’s life. Contino said that attentiveness is crucial in investing in Great Books, and that the practice of attentiveness will extend far beyond literature into personal and spiritual life. “Studying classic texts requires attention and that act of attentiveness can manifest itself in others ways,” Contino said. 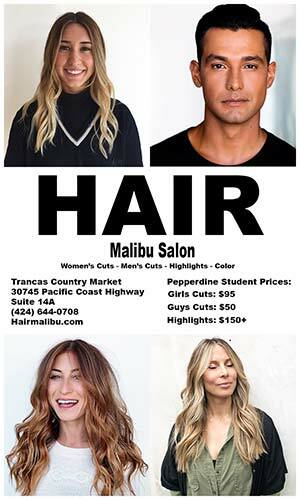 These enhancements include paying better attention to others, as well as a manifestation in spiritual life, Contino said. Focusing attention on classic literature is practice for focusing attention on God, the Bible and prayer, Contino said. After Contino spoke for the first half of the convocation, a student panel discussed their personal experiences in Great Books and how their lives have been affected by the colloquium. 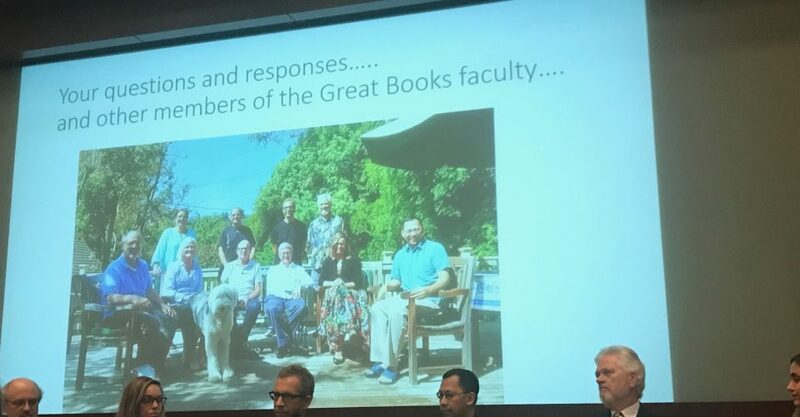 The Great Books Colloquium usually begins in a student’s freshman year and takes four courses to complete, according to their website. There are a wide variety of classic pieces of literature to read and discuss, ranging from ancient times to more modern classics. 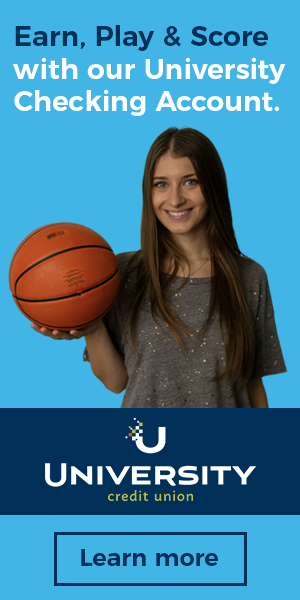 In doing so, a student is able to fulfill several general education requirements. Hancock said that the course cannot be discussed without mentioning the spiritual impact it offers to the students that take it. He said that in order to get the full impact of the literature, students must fully immerse themselves and interact with the text. Students must also interact with one another and by doing so they get an all-encompassing look at the course, Hancock said. “We get to learn about the building blocks that have shaped the present, and we have a broad framework with which we can discuss current events,” sophomore Anemone Hansen said. “The best parts of Great Books are the conversations we have with each other after we’ve read. Senior Jordan Diab, who was also on the panel, provided her take on the colloquium and what it brought to her Pepperdine experience. 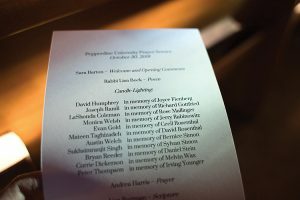 Diab said friendship and happiness were some of her biggest takeaways from immersing herself in the text. Diab said that the course has taught her how to ask the right questions, think deeply and immerse herself in those around her. She said how intricate the process of learning can be and the way that Great Books allows for that to happen on a daily basis between class and the discussions with classmates. Lastly, a panel of all of the Great Books professors were called up to answer questions from the audience. They emphasized the idea that people should be continually learning, and Great Books allows for that to continue. Great Books can be taken in a spiritual or historical context, but either way it can teach something new to everyone.